If not many will go through the trouble of building a modern cylinder player, fewer still are those who will build a cylinder recorder, a hundred years after they had their day. But here is one, Christian Pillet's experimental machine. 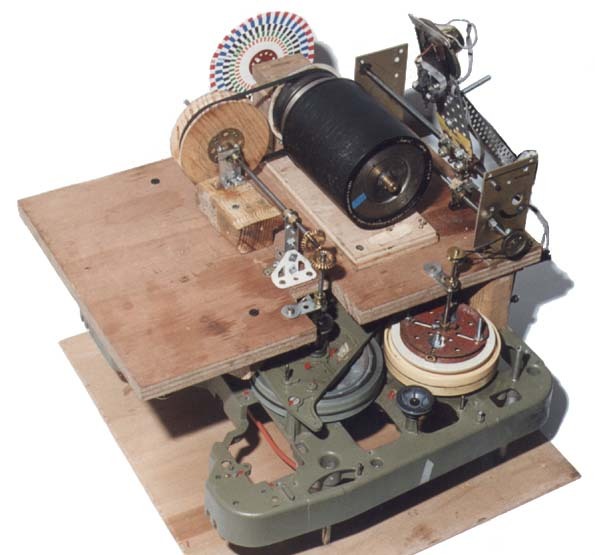 At the bottom is the chassis of a Grundig TK 46 tape recorder with its main motor, flywheel and rewind motor still in place. The main motor is fairly powerful, which is important when carving out a groove in a wax cylinder: you won't want it to lose speed when the going gets heavy in strong passsages. The motor drives the flywheel by a belt, from there the motion travels on via a pair of 90° pinions to a pulley which drives the mandrel by a belt. The mandrel comes from an old Pathé N° 1 and holds the cylinder in a steady grip. 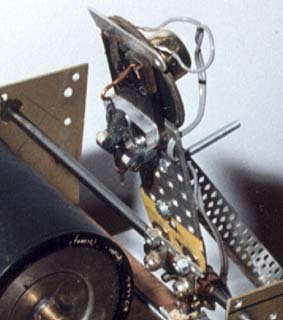 The tape recorder's rewind motor drives the feedscrew that moves the recorder head along the cylinder. 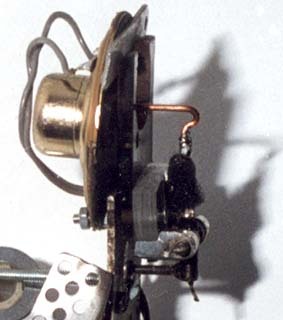 The recorder head with its loudspeaker, connected to the pivoting arm of an old reproducer by a copper extension. The cutter juts out at the bottom of the image. The recorder head about to be lowered onto a cylinder. The cylinder in this case is a moulded black wax cylinder, not suited for recording. The really tricky part is the recorder head. In Christian Pillet's machine a signal from a common amplifier is fed to a small loudspeaker. To its membrane, he has glued an extension to the arm of an old recorder head. On the other end of this pivoting arm is the cutter itself, which he says should be cylindrical in shape, and of course of a very hard material. The cutter should make an angle of 30° - 60° to the tangent at the point of contact with the cylinder. Recordings are made on old brown wax cylinders, such that are so deteriorated they can no longer be made to give away any sound at all. The surface is first shaved down by spinning the cylinder and shaving its surface off with a hand held tool, then covering the cylinder with turpentine oil to soften it. After an hour it is ready to be cut. After many attempts, most of which gave no audible sound at all, Christian Pillet has been able to record a few cylinders, but always with modern music. We should not try to confuse our heritage of recordings by deliberately forging cylinders. The recorder head on its arm.